This patio design draws the dining area out into the yard as a destination spot. Although this patio is placed adjacent to the back of the house, it's simple curved design creates pockets for activities such as dining, or gathering chairs around the built-in fireplace. This patio plan features an area for dining set off by the circular pattern of concrete, and a separate fireplace pavilion connected with beautiful landscaping and hardscaping. 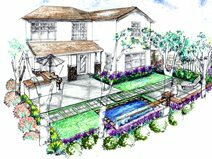 Designer/contractor Scott Cohen takes you to several homes to show you ideas for patio placement and layout in your yard. One of the greatest mistakes I see made by novice designers is the tendency to place one large slab patio at the rear of the house. While this might be a traditional layout, in actuality it is rarely practical. For the best and most functional patio design, you need to consider exposure to sun and shade, proximity to the house, and outdoor views, along with activities to accommodate such as entertaining, dining, cooking, and sun bathing. Watch the video to learn how to "break up" patios to create various outdoor rooms. You'll also discover a simple tool landscape designers use to plot out and adjust patio placement ideas. 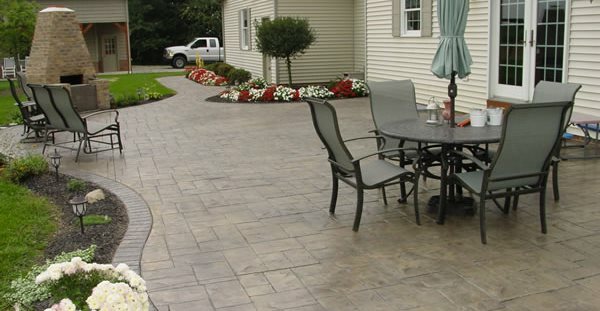 The first step in making patio plans is to consider the functionality of the space and how it will actually be used. On day one of Landscape Design School the instructor writes "form follows function" on the chalk-board for all to see. Keep this time tested adage in the back of your mind as you layout your back yard space and you can't go wrong. Unless you regularly hold large meetings and need everyone in one oversized patio area, you will be better off breaking up the space into several smaller patio areas, or "outdoor rooms". 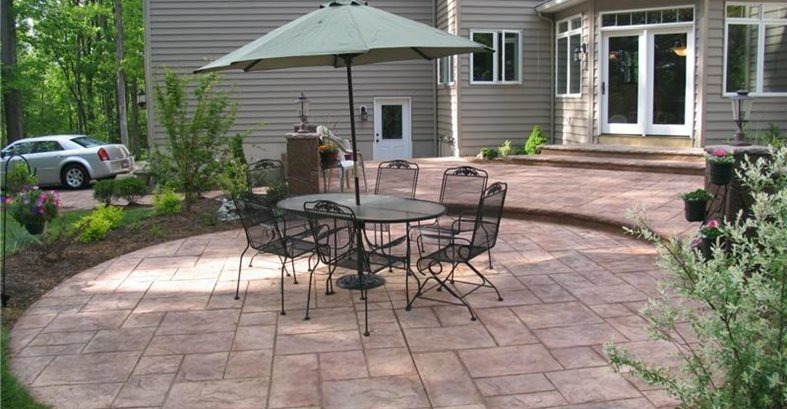 Learn more about designing concrete patios at ConcretePatio.org. Get tips for patio shapes, choosing the right patio size, cool concrete patio projects, and more. It is typically best to create several outdoor living areas to accommodate the natural tendency of people to break into smaller groups. Next time you are at a party, observe how the guests break into smaller groups and then travel to visit other groups. 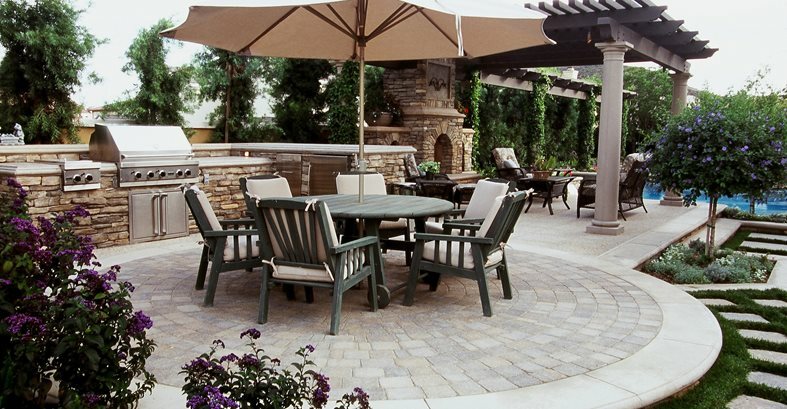 Design your patio layouts accordingly by creating several areas of interest throughout the back yard. An open backyard space is like a blank canvas full of opportunity for designing an inviting patio. However, this space can also be overwhelming bringing up questions such as, Where do I start? What size patio should I put in? What options are there? 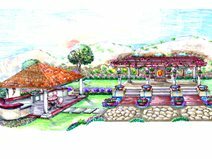 From award-winning designer, Scott Cohen, here are four patio design sketches you can use to get ideas for your backyard space. One of the keys to designing inviting, outdoor spaces is to create areas that draw people out into the yard. Even on smaller properties, backyard patios don't have to be just one big, rectangular slab placed at the backdoor of the house. In this sketch, you'll notice the patio and dining area off one side of the house, but you'll also notice the water feature and concrete seating area at the outer edge of the property. Design Tip: Avoid having a patio placed only at the back door. Give people a reason to get out and enjoy other areas of the yard. On larger properties, you can easily create multiple rooms that tie together with creative landscaping and hardscaping. In this sketch, the outdoor dining area and living room area are created as two separate entities. The yard is very functional as a whole with pathways to each destination spot. 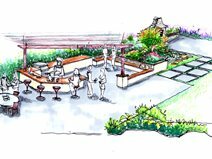 In this sketch, the largest area has been dedicated to an elaborate outdoor kitchen. Ideal for entertaining, this patio provides ample space for people to gather and to accommodate tables and seating areas. Design Tip: When choosing your patio size, remember to allow extra room for people to walk around tables and behind or between outdoor furniture. Your patio should be large enough for your table or furniture, but will also need to include that extra walkway of space for traffic. 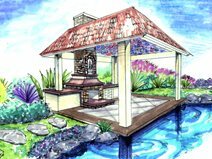 This sketch illustrates the serenity of a secluded outdoor living room. Set alone out in the yard, this concrete patio features an ornate outdoor fireplace which appears to be floating near the water. Accessible by pathways, this patio creates a focal point in the backyard. It is also large enough to accommodate furniture without being too large to detract from its intimate appeal.